Today we are going to cover a topic which every android user must read before using Android smartphone or if you are using Android since very long time then you can also read this post to know about the top 10 smartphone safety apps for android, which you must have on your android smartphone to be safe while using smartphone. This post complies with top 10 best safety apps that you need to install on your phone and the app you will install will help you in many ways to be safe on the web. Below we are going to share Best Safety Apps for Android 2017 edition with you all. In today’s world we are love to hang out with friends or alone and if that time you being alone and sudden you face an offensive situation or you are a girl and you took a Cab but the driver isn’t a good person and he took you to wrong place. That type of situations may change into bad to worst and in these kinds of emergency cases, you need the help of your friends and family instantly at any cost. So preventions need to be taken before entering into this kind of cases and this is why we are going to share top best android safety app for our users who want to be safe all the time and want to take full advantage of your smartphone. YES, Google Play Store fill with more than 3 million apps and most of them are made for entertainment purpose only but if you want to take the best advantage of Play Store then you need to take a look at the apps we are going to share on “Best Safety Apps” topic. All apps are free and ready to use at any time, all are made from official owners and we are not going to add any fake app which will give you back step in need. So once you have done with this post then you will be aware with Valid Safety Apps for Android smartphones. And with the help of any app, you can send your location and plenty of data to your friends, family, husband, wife and so on. You can choose any app which you like based on star rating + downloads on Google play store and then you can be safe from serious mishappenings. You can share these apps with your sister and mother so in case they need your help then they can easily contact you or send you a message by these personal security apps for Android. 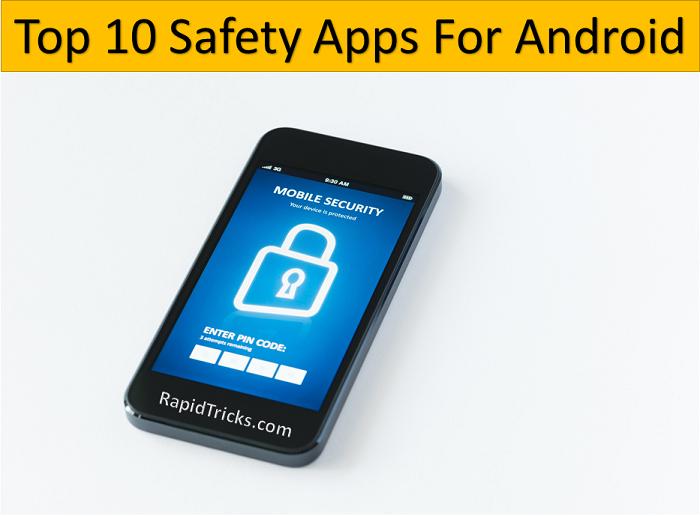 This is the first application in the list of top 10 safety apps for your Android smartphones. With this app, you can easily send quick messages (Emergency Message) to your friends and family, All you need to do is pressing your phone’s power button three times. Just open the App on your phone and add the contact number or emails of your family and friends to whom you want to send an automatic message in the emergency. Now click next and select the alert frequency of your message, there are two frequency options one is high frequency (Alert in every 3 minutes) and another is low frequency (alert in every 5 minutes). On the next screen, you can set your 4 digit pin and you are good to go That’s it! This app is little similar to the first one and difference is just of a line between these two apps. In vithu safety app, you just need to press your power button two times and it will send an automatic alert in every two minutes to your registered contacts. Registered contact will receive a message like “I am in danger, I need help. Follow my location” in every two minutes. They will receive your updated location in every two minutes. Install and open the application on your phone, select the emergency contacts. Select and save the contact to which you want to send the emergency alert. You can also share your story in the news feed of the application and also you can read others stories as well to take precautions. In the application, you can also set the show alert for upcoming episodes of “Gumraha crime show”. Circle of 6 is a private safety application, as the name suggests “circle of 6”, You can select up-to 6 trusted friends in your circle using the application. If you get into any type of trouble then you can easily send a pre configured message to your 6 trusted friends in the circle. You can easily get your current location with one tap and send it to your trusted friends circle instantly, so they can follow you. You can also call authorities of national health and safety hotlines by just one click. Open the application and create a circle of your 6 most trusted friends whom you want to call in the emergency situation. Create a custom emergency message for your friend’s circle (it will be sent to your circle with your location). Add a custom number to which you want to call in the emergency. Bsafe is a personal emergency android app specially made for girls and it comes with lots of features which provide tons of everyday safety to the users. You can send an alert message to your friends 24/7. This app is designed to keep you and your friends safe 24/7 with its amazing features. Create your own private social network with your friends and co-workers. You can share your location with your network more easily using the app. Ask your friends to walk you home and track you with live GPS tracking option built in the app. You can also suggest the safe way to come to you using the GPS. Use the “I m here” feature to tell your network where you are right now. Tap guardian alert button whenever you are in trouble, it will send an instant alert to your friends, family, co-workers or to anyone you have selected in your private network. Install and open the application on your android phone and select the contact to make a private safety Network. Setup the private message to alert your friends and family. Tap the button to send an emergency alert to your private circle. As the name suggests “Family Locator App” this is the application which can be used to create private circles with your family and friends. Using the app you can easily check the real time location of the members of your private circle, which is an amazing feature of Life360 family locator app. Create your own circle with your friends, family or co-workers. Chat with the whole circle or an individual easily. Access the real time location of your private circle members. Get alert when any member of your circle arrive or leave destinations. Track the stolen or lost mobile phones. Locate Android and iPhone both with family locator feature. Install and open the application, create a group or private circle with your friends and family. By just creating the private circle you are good to go, now you can enjoy the awesome features of the application. All the features which I have explained above are very helpful and help you and your family stay in safe zones. Nirbhaya App is an application which can be used in any case of emergency to protect women’s, children etc by using a single click. If you are searching for the child safety apps for Android then you can download and use this application. You can also use this app to create safety areas heatmap of your city or any other city. Using the application you can Create a Geo fence at your current location or any other location and keep your friends, guardians and cor-workes informed. Use “Stamp” feature of the application to mark any safe and unsafe area of any city to make aware the peoples. Tap the SOS button in the application and an SOS alert will be sent to your private group you have built in the app. You can also easily shake your device to send alerts to your private group. You can also access the heat map to know the safe and unsafe location near by you. Heat map will indicate the green location as safe and red location as unsafe. Not only these but also you can post your emergency alert message to your Facebook wall. Install and open the application on your phone and create groups (You can create multiple groups for example family, friends, co-workers etc). Create an emergency alert message to send it to your group with one click. Access the map and mark the location as safe or unsafe to let people aware of those locations. American red cross is an earthquake notification application, you can use it to be alerted when any earthquake occurs near by you so you can save your family and home. Let others know that you are safe even when the power is out. This is a must have application for any earthquake prone area. Get instant notification of any earthquake and its intensity and impact on your area by the notifications generated by United States Geological Survey. Easily translate the English language into the Spanish language using the language toggle. Let others know about your situation by the custom alert for facebook, twitter or emails. Build in flash light which helps you to see at night when there is no light or electricity around you. Step by step instructions to use the application easily and take the safety precautions. Not only these but there are much more features of the application. Install and open the application use the on screen instructions for using the application. You can use this application to help others and click pictures and send to other to let them know about the situation of your area. This is an amazing health application, which you can use for many health check-ups like Blood pressure measurement, Heart rate measurement, Blood oxygen measurement and much more. You can use this health application to do many health checkups, this is all in one application to test your blood pressure, Heart rate, Blood oxygen, hearing measurement etc. iCare health monitor application is very easy to use just press the screen with your finger and hold until the test is done. No technical or medical skills required, this app is for everyone. Integrated many types of workouts for health and fitness. Install and open the application and tap on the test you want to do, there are many health check tabs available so you can select any according to your need. Now Hold the screen until the test is done. Don’t press the screen too hard otherwise, it will affect the test results due to the alternation of blood circulation. When the test is done see the results, that’s it! This is another security application and very helpful and easy to use. If you ever felt unsafe then Watch over me app is for you. You can simply press your phone or smart watch and all the members in your personal safety network will receive the notification and they will be able to track your location on Map. Is not it an amazing app, do you think so? Then install the app on your phone and be safe and secure. This application is specially developed for women’s safety, you can easily use this app and with just few click you can send the information to your emergency email contacts. You can easily click a picture of the situation or send text easily with this application. Install the open women safety shield protection app. On the main screen, you will see few options like Emergency, walk with me, police etc. You can use these options to contact your friends and family or police. From the emergency tab, you can send a message to your group and you can also call the different police stations from the inbuilt list in the application. So these all are the best safety apps for android and I hope you find them helpful. If you liked it then give it a share on social media platforms such as Facebook, Twitter, and Google+. We hope you find this post on “best smartphone safety apps” for Android users. If you have any queries or feedbacks regarding this post then you can drop your comments in the comment section below.